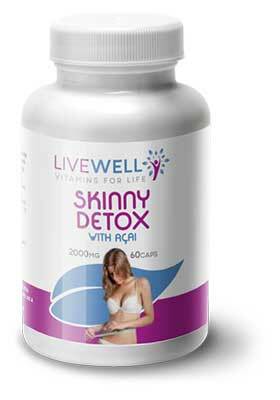 Skinny Detox is a specifically designed supplement. Skinny Detox contains 60 capsules, enough for a 30 day course. Manufactured from selected natural and potent ingredients. %NRV: Percentage of Nutritional Reference Value. Allergens: For allergens, see ingredients in bold. Product free from porcine/bovine gelatin. Take two capsules at night before bedtime with a full glass of water. Best results achieved over a 30 day period. Allow 1 week between each Skinny Detox course. Taking this product without adequate fluid may cause it to swell and clock your throat and may cause choking. Pregnant or nursing mothers, anyone on medication or with any medical condition should see a doctor or pharmacist before use. Not be used as a replacement for a balanced and healthy lifestyle. Store in a cool dry place and out of direct sunlight. For best before date see base of bottle. Available branded, white label and private subject to minimum order requirements.